Quick business post: After much consideration, I’ve decided to restructure the Selkie/Sue and Kathryn Patreon campaign into a Free-Will Donation format, which means merging all the content into a simple Patrons Only tier. More info can be found on the page’s activity feed here. Then about 45 minutes prior to writing this I looked at the strip I was working on and nearly fully inked up and said, “Wasn’t tomorrow a golden opportunity for shenanigans? 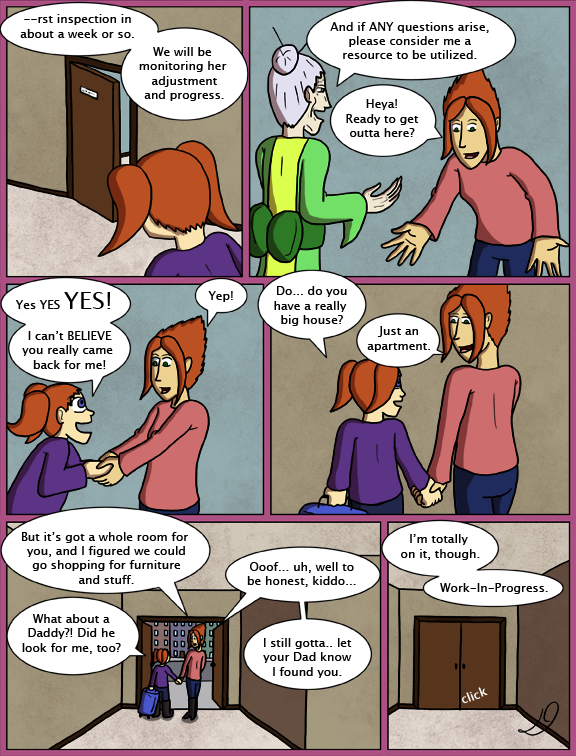 In my head canon, Andi just had no idea how to set up a room for an eight-year old so she's winging it with a shopping trip. “Work in progress.” Yeah right. If this is to have the slightest chance of ending well, she will HAVE to start with the whole, “He thinks you’re dead,” thing. I’m predicting an explosion of roof shaking proportions. I’m going to guess he’ll simmer rather than explode as he won’t want Selkie to be caught in between. And give he probably knows Andi’s relationship with her mom, he may actually be somewhat understanding (after wading through the waves of rage and disappointment). She kept Amanda secret for the 8 or 9 years they were together. I think they’re beyond any understanding involving the mother. I doubt he’ll simmer. He exploded all over the teacher (who’s name I don’t recall at the moment) when she wasn’t able to protect Selkie on a 100%, helicopter parent basis. In truth, Todd’s not the most mature parent either. He’s a work in progress himself. The April 1st joke is that Andi or Amanda is dreaming this whole sequence. The Aril Fool’s joke is Amanda’s face when she realizes that Selkie is her sister. Once again, it’s just time to wait & see what happens. Don’t worry, you fooled me when I thought the F’s were about Andi not telling Todd. I really noticed how niave Amanda is about the circumstances of her adoption. I know it could be seen as just oblivious but it really sinks in. I meant the circumstances of her being given up for adoption. And you really had me fooled with the F’s, seriously. I’m going with the vote counter being the April Fools joke. Because that’s either broken, or a joke. And it’s changed again – when I made that comment it was saying Selkie’s ranking was 5 thousand some-odd. That has to be TWC pulling a funny. I refreshed the page and it went to 5225. Refreshed again and it said 20. With about 6000 webcomics listed during the month, there must be a reconning of the accounts; a re-tallying of the votes. Each month, on the first second of the first minute of the first day, all the counters reset to 0 (zero). The reconner then recons the algorithm, and last month’s rankings are added to the zero reset of all the accounts. My schetz is dat you found it as it was resetting, and are not at zero, like some of the comics which only get 15 votes per month. You can go to the TWC page and see on the right side, the count -to date- for your comic. Hey Dave, could you please shorten that little ffff line it makes scrolling to the comments on my phone kind of hard? Oh, what a kidder, kitenkaiba. April 1st and all that. The tonne o’ F is absolutely fine, Dave. Don’t you worry. I want to thank you for not doing an April Fools day joke though. I’m…just so sick of those. Fall asleep at your keyboard? Okay, so Amanda is still purely ecstatic. Wonder when she’s going to start asking more scathing questions. They’ll probably start after Amanda finds out who her dad is. Still gotta let you dad know I found you? Ha! Still gotta let your dad know you’re even alive! That’s the part I think Amanda will be upset with the most. Yeah, he passed her up for her rival. That’s going to hit hard sure. But as up front and strong a personality as she is, to be told Andi said she was dead, thus robbing her of her real family? That’s a declaration of war there. Can’t say I would blame Amanda. To be fair, Amanda didn’t initially tell him she was dead. She said she was no longer with them. I think she intended to be honest, but he misinterpreted it and seeing his grief (while going through his own) she never gained the courage to correct him. Whoops! I mean *Andi*—not Amanda! Uh… I’m pretty sure Andi told Todd “the baby” was dead. So yeah, she totally lied right to his face and has never had the balls to admit otherwise. Let’s see what she says now that she found Amanda. I’ve said before that Andi is not a favorite of mine. Her behavior in the past has been despicable in my opinion but real people do these things. Is she truly trying to make amends? Dunno. But I truly hope Todd never goes back to her. Like… EVER. Jade, she actually *didn’t* at first. I don’t have the link, but check out the archives. I re-read them when the Andi/Amanda story started a week or two ago. Andi told Todd, “She’s no longer with us,” and Todd immediately interpreted it as death (totally justifiable), but it appeared Andi was trying to tell him the truth at first. She probably became too afraid to tell him the complete version after seeing his initial reaction. So even though it became a lie, it appears not to have started out as one. But in the even *earlier* flashback, told in pictogram form, she pretty clearly indicated that the baby had died. Also, Dave has told us that Todd’s parents have the supposed ashes in an urn. Selkie: Yous. No. No! Yous cannots be my sisters! Haha:) I hear Luke and Vader with the “I’m your father” conversation. Which is which depends on who finds out first and delivers the “bad news” with relish, or dread. I’d take it with relish and perhaps some coarse ground hot mustard. I’m a big fan of crazy story shifts – this would be my dream. Andi reveals to Todd that Amanda is his daughter. He is surprisingly receptive and returns Selkie to the orphanage. The rest of the story is a slice-of-life comedy focusing entirely on Andi, Amanda and Todd. NO. No no no no no no no. Selkie is his daughter. Selkie has been abandoned by one parent already. Todd adopted her because he remembered what it was like to be alone and unwanted, and he knows the chances of her being adopted again are nil, particularly because of the species thing. Todd loves her. Agent Brown would never stand for this. LILLIAN would never stand for this. Selkie is not getting returned because that would go against everything the comic up to this point has stood for, everything TODD has stood for, and would be absolutely cruel. If anything, he’ll accept Amanda as his daughter IN ADDITION TO her. … Sorry, you kinda hit my berserk button. >_> Story shifts are one thing, but that would be the kind of thing that would break the story irreparably because we would never be able to sympathize with Todd after that. Hell, I don’t even think AMANDA would be able to sympathize with Todd after that, considering she was returned already. Um… Yeah. Gotta agree with Regalli. 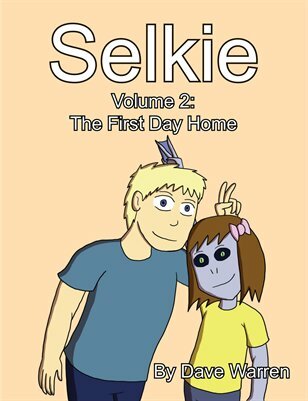 This is a slice-of-life about “SELKIE”, hence the title of the comic. Your dream doesn’t have her at all. Sure, ya can dream:) But, really, I prefer this story to that one you described. Still don’t like Andi. At all. You go, Dave! Make characters that are hard to dislike! In this hypothetical scenario where Selkie is returned to the orphanage, that would be more likely to basically write Todd and Andi out of the story all-together. I hope skeeball was just continuing the April 1 theme. Just want to note that I’m fairly certain when you’re the actual writer, it’s not headcanon, it’s just canon. You admittedly have the opportunity to technically change a fact later if you haven’t written it into the story “as printed”, but at the point *you* say something publicly, it pretty much becomes canon. Oh yeah, I agree. I try to be careful about what I do and don’t say about the characters for that reason. It’s kind of like Dumbledore being gay: Rowling may not have put that in the books directly, but it’s now an established canon thing all the same. If it were something distant–“in my head canon, they grow up to be pirates”–I can buy that. In a case like this, where it’s internal reasoning for something that’s happening right now, the “work in progress” framing doesn’t really work. And either way, since I’ve always thought of the definition of head canon as being “This is the way I strongly believe it should have/did happen, regardless of proof otherwise” sort of goes against the spirit of “work in progress” ideas. On Dave’s comment, it’s of course very true that if you want the suspense and anticipation, even statements of negative can totally blow it. Sometimes authors want that, of course–there’s another comic I’m reading in which the author recently flatly stated in the comments that something generating speculation wasn’t the case, because it simply wasn’t a comic about that, and she didn’t want people getting hung up on and distracted by the topic. You haven’t ruled out that Keisha might do _hurtful things_ because she’s hurting. Which is… slightly different than Villain, I think. Well, I suppose that depends on how hurtful the things she does are and to whom she does them… still, it can be difficult to pull it off without the character appearing as a villain. I’m sure Dave could pull it off well if he decided to have Keisha turn against Amanda after all. *facepalm* Oy! Don’t anybody think we’re in calm waters now. The real storm is still there on the horizon. Just think, if you had remembered what yesterday was, you could have had Keisha come barging in at the last second in a totally awesome action sequence and impress Andi so much that she decides to adopt her instead of Amanda. I’m a bit disappointed by the sequence of Fs. My first thought was it might be an extra panel as hex-coded bitmap. But this way it would be just a plain white area. I still gotta… …let your Dad know that I lied to him and he’s a father, and that you’re his daughter, and that you’re not dead, and he passed over his own daughter to adopt a secret war orphan. Yah, everything’s gonna be FIIIINE.